If you need to locate your Cub Cadet model number and serial number, we can help! Find your Cub Cadet equipment below to see model and serial number locations. 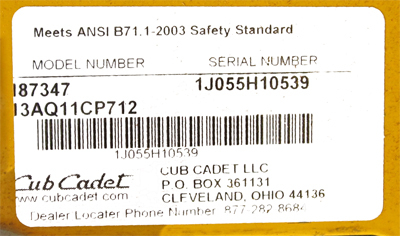 Cub Cadet's (1997 and later) use model and serial numbers 11 characters long. They can be a combination of numbers, dashes or letters. Identification stickers are located in areas that are unlikely to be replaced. For example, under the seat frame. The stickers are about 2" x 3" in size. They also have Cub Cadet's name, address, and customer service phone number listed. The model and serial number on a Cub Cadet riding mower is located under the seat. The model number will begin with a 13 or 14. The model name on a Cub Cadet single stage snow blower is located on the side of the auger housing.